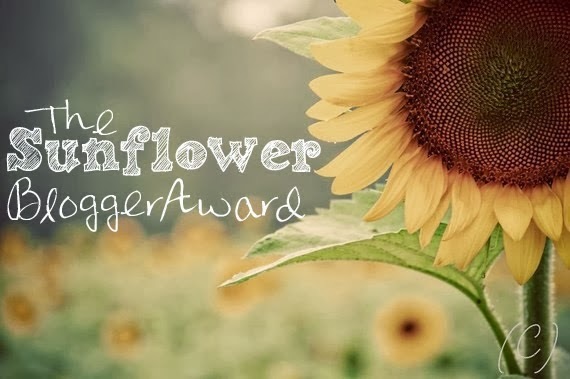 I was in the middle of writing an exceedingly dreary paper (and trying to make it as non-dreary as possible), when I saw that I was awarded The Sunflower Blogger Tag by Maribeth of Formidable Courage! Maribeth, you could not have tagged me at a more perfect time. My mind was almost shriveled to away to nothing, when I read your delightful post and saw that I was tagged! I now feel quite restored. 🙂 Thanks for the fun opportunity! 4. Set questions for the nominated bloggers. 1) I used to have a 30 gallon fish tank a few years ago. I gave away my fish and got rid of the tank when we moved. I never even think about that tank anymore, but for some reason at night, I have recurring nightmares about my fish! In my dreams, I’ve either neglected my poor fish for years and they’re all dead and the tank is filthy, or else I try to clean the tank and find snakes and all sorts of creepy animals inside the tank, trying to bite me. The dreams are quite stressful, and I can never seem to get rid of them! 5) Once when I was about 6, I started writing an extraordinarily politically incorrect story that began, “Jack was a regular, poor, lonely crippled boy. Until it came.” I never got past the opening line. 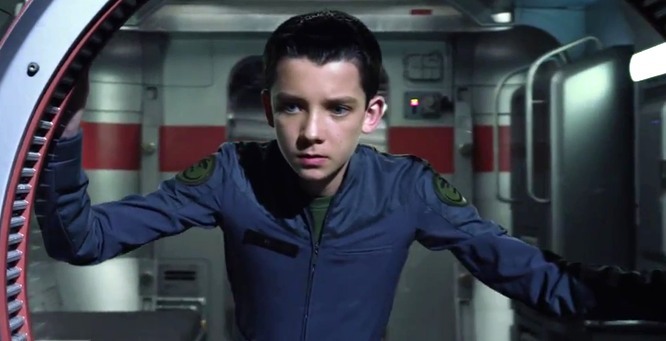 Ender’s Game: I usually don’t care for sci-fi, but this was just a good movie. Good characters, good story line, good music, good effects. And let me tell you what, Asa Butterfield (who played Ender) can act. He was incredible. Aside from a couple of crude comments, it was very clean – just a bit emotional. Jack the Giant-Slayer: When I saw the trailer for this movie in the theater, I swore I’d never watch it. Well, I’ve seen it twice already. 🙂 There’s some violence, some crude things, and two really bad words. But overall, I was surprised at how much I liked this movie! I kept expecting it to get really cheesy, but it was surprisingly believable (for a story with massive bean stalks and talking giants). The characters were very endearing and noble – especially Elmont (shown below with the goatee and black armor), played by Ewan McGregor. He was just plain awesome. Iron Man 3: As you probably know by now, the original Iron Man movie is my favorite film of all time. But I’ve never seen Iron Man 2 (because I heard that it ruined Tony’s character) and I was really leery of Iron Man 3, as well. I shouldn’t have worried, though. It was such fun, very exciting, and so funny. I can’t remember the last time I’ve laughed so hard when watching a movie! (Mom and Dad previewed it first, and skipped/muted a few really bad scenes.) 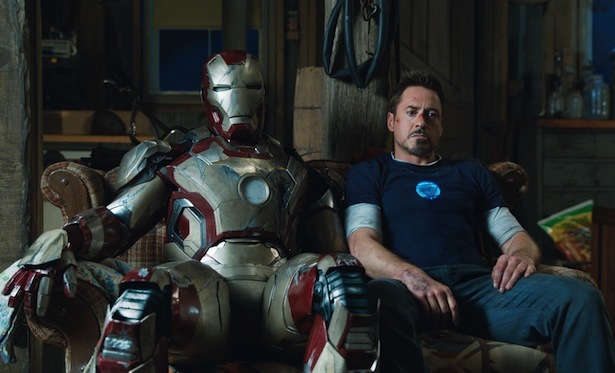 I especially loved the fact that, whereas Iron Man dealt with Stark’s initial change of heart, Iron Man 3 shows us much more of the “new” Stark. Most movies change a character and then leave it at that. I really liked getting to see the changed Stark in action. 7) I’m reading through Northanger Abbey at the moment, and quite enjoying it. When I finish, I will have read all 6 of Jane Austen’s books! 8) I am addicted to the Spicy Chicken sandwich at Chick-Fil-A. 9) I play the violin (though I haven’t picked it up in a while). 10) Though I have never read a single work by Shakespeare, I plan on reading several of his plays as soon as I am finished with college. 11) This fact isn’t really about me, but it’s so amazing that I just have to share it. My great uncle helped to liberate the Dachau concentration camp in Nazi Germany in WWII. As they were moving into the camp, a young Polish man (a prisoner) ran up to my great uncle and asked for a hand grenade. He said that he knew where a group of Nazis were hiding out in a bunker, and could take them out. It was a risk, trusting the man, but my great uncle gave him the grenade. The man blew up the bunker, as promised, enabling my great uncle and his fellow soldiers to move further into the camp and liberate the prisoners. Fast forward 40 or 50 years, to a mall in Louisiana. My great uncle and his wife were quite old by this time, and were taking their routine walk through the mall. Apparently lots of other older folks liked to take strolls through the mall as well. My great uncle got tired, and sat on a bench while his wife did some shopping. Presently another elderly man sat next to him, and the two started chatting. As they talked, they realized that they had both been in Germany at the same time, in WWII. They began finding more and more similarities in their stories, and kept comparing information, until they found out at last, to their complete shock and amazement, that the elderly stranger was the young Polish man who had asked my great uncle for the grenade all those years ago! Who is your favorite character in the Bible (besides Jesus)? Well, I’ve always had a soft spot for Peter, because he talks way too much and gets himself into trouble. But as far as my favorite…maybe Timothy. I know that he doesn’t show up very much personally in the Bible, but from what Paul says about him, from the advice Timothy receives, and the difficult position of church leadership in which Timothy finds himself as a young man, I have a great respect and love for him. Do you consider yourself an outdoor person? If so, what are your favorite outdoor activities? If you could live anywhere in the United States, where would it be? North Carolina! Nothing beats the beauty of the Blue Ridge mountains. What noble character quality do you admire the most? The first person that popped into my head when I read the word “noble” was Steve Rogers (aka Captain America). He’s such a noble character. 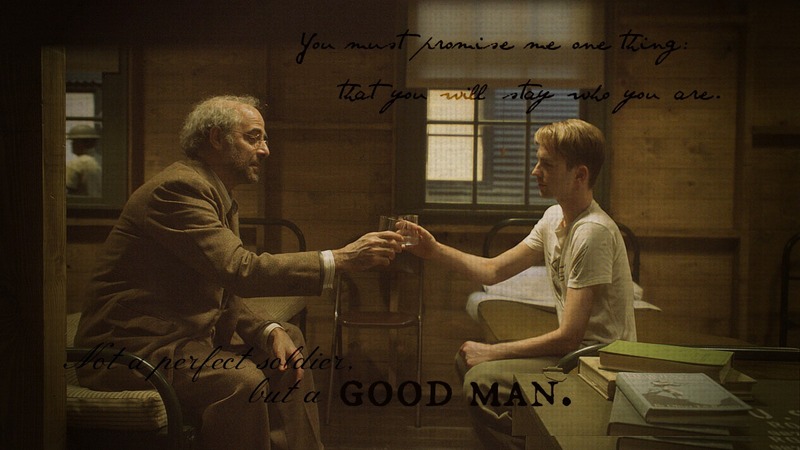 I would have to say that, in Steve or in any other hero (fictional or real), courage is the character quality that I admire most. After all, like C.S. Lewis says, “Courage is not simply one of the virtues but the form of every virtue at the testing point, which means at the point of highest reality.” Without courage, every other noble quality would give way in the face of danger, pain, or fear. Courage is the glue that holds all the other virtues together. In what ways has God comforted you in the recent past? Anyway, this has been exceedingly depressing for me, as a lover of literature, to see true literature pushed aside to make room for my professors’ own agendas. Just when I was in such sore need of encouragement, I happened to pick up Kantor’s book from the library. It is SO good! It is much more than just an attack on the educational system. It is a thorough, clear, entertaining overview of the major English and American literary works and authors. 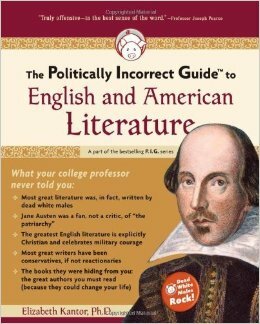 The title isn’t kidding when it says that it is a politically incorrect guide: this book is the best guide to classic literature that I’ve ever seen. It could easily be used as the foundation for a high school literature course. I’m planning on buying it soon. I highly recommend it! More than that, though, it has been like finding a spring in a desert for someone whose soul has been parched by college classes. I’m so thankful that God sent me this book right at this time! Fish and chips, of course!!! 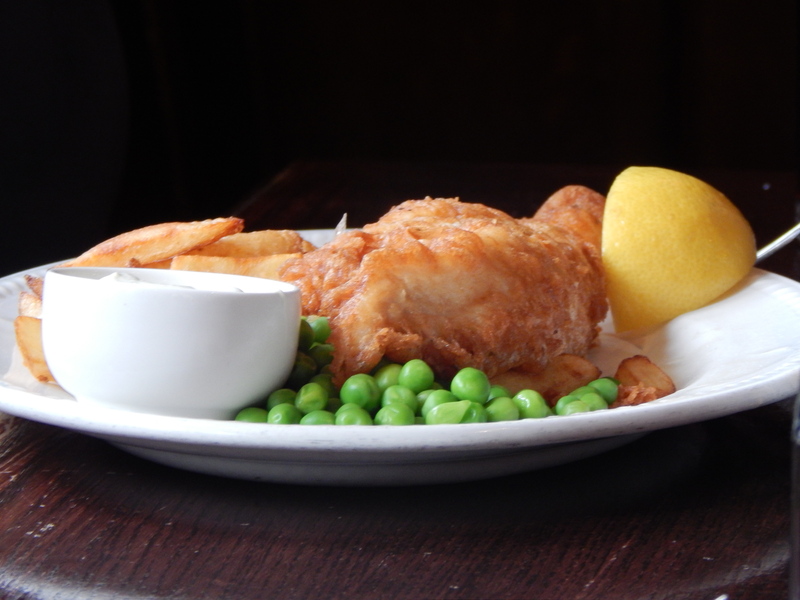 😀 I had true, authentic, original British fish and chips twice during my trip to England: once at The Red Lion, and once at The Eagle and Child. Those were two of the best meals I’ve ever eaten! Here are your questions. I am really looking forward to getting to know all of you a little bit better! What time period would you travel back to if you had the chance? Why? Is there a book that you’ve read at least five times from beginning to end? Has the Lord done anything recently in your life that has strengthened your faith in Him? What has been your favorite movie this year? This can be in theaters or just from your own personal home viewing. This was great fun – thanks again, Maribeth! I’m really looking forward to your post! 😀 You’re very welcome – it’ll be great fun to get to know you! I grew up in the foothills of the Blue Ridge. So achingly beautiful. Thanks for the nomination! I’ll work on my post this evening. I’ve been looking over your blog, and it seems that we have a very similar taste in movies!! You’re the only other person I’ve ever talked to who has seen Jack the Giant Slayer! 🙂 You’re very welcome! I can’t wait to see your post! I saw it in the theater, even! Great fun, I must say. My post is here. 10 – I’d recommend Hamlet. I found your blog through the Formidable Courage Sunflower Award post (I have been reading the chain of these ever since I got tagged). I have got to find this politically incorrect book . . . I just checked our library site and there are tons from this series. Fact 11 in AMAZING. Thanks so much for taking the time to comment – I love hearing from fellow bloggers! I know! I never get tired of stories about my great uncle (he had many more crazy stories – like the time that he and his troop missed capturing Hitler by about three minutes). I only wish that he would have lived long enough for me to meet him and talk to him about it. Yes, you really should read that politically incorrect book! I don’t agree with everything she says, of course, but overall it’s very eye-opening and encouraging! What a delightful shock! Is that actually my button on your sidebar???!!! 🙂 Thank you!!! Hem! Okay, all right, let me collect myself… I really popped in to say that I love your description of how you enjoy the outdoors! 🙂 And the literature book looks really good. I’ll have to look it up. Also (when you get into Shakespeare), I would recommend Much Ado About Nothing. It’s my favorite and I’ve read it a couple times. It’s also fun to kind of do a plot point comparison between it and P&P. I don’t know if you’ve ever run across it, but Peter Leithart has a really good book called “Brightest Heaven of Invention: A Christian Guide to Six Shakespeare Plays” that is also a really good introduction to Shakespeare in general. And last point – I was wondering…are you going to be doing a cover reveal for The Princess and the Prince?